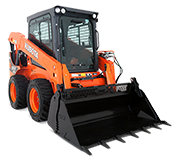 Excellent power and exceptional operator comfort bring new levels of performance and productivity to Kubota’s SSV-Series Skid Steer Loaders. A unique vertical lift design takes moving dirt to a whole new level. Super long reach, multifunction levers for fingertip control, hydraulic quick coupling and Kubota Shockless Ride for the ultimate in comfort.